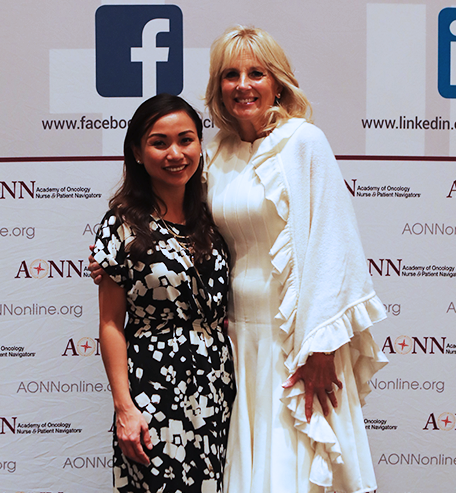 Carol Bustos with keynote speaker Dr Jill Biden at the AONN+ 2018 Annual Conference. The Lynx Group. CRANBURY, NJ—February 13, 2019. The Lynx Group announced today that Digital Communications Manager Carol Bustos has been nominated for a 2019 Folio: Digital Award. Winners will be announced at an awards luncheon to be held on Thursday, March 21, at the Yale Club in New York City. The annual event recognizes individual and team excellence in digital media. The Folio: Digital Award is the publishing industry’s most prestigious trophy, and this year’s finalists truly represent the highest quality work in the digital space. Competition was fierce, with entries received from every sector of publishing—mass consumer, enthusiast, B2B, association and nonprofit, city and regional. “I believe our Digital Awards do more than honor the most creative and innovative brands and people in magazine media, they also shine a spotlight on the significant changes happening in our industry,” said Caysey Welton, Content Director at Folio. Each nominee has pushed the boundaries of digital content, product development, and audience engagement. Awards will be given in more than 20 categories, including several that are new this year, such as Digital Activation, Best Video, and the category in which Ms. Bustos has been nominated, Audience Engagement/Community Manager of the Year. Folio: is a multichannel resource for the magazine and online media industry. For more information, please visit Foliomag.com. Click here for more information about the awards, to attend the recognition program, and to view the full list of nominees.